If you’re the skeptical sort, you might assume that Khabib Nurmagomedov took his UFC 160 fight in May with Abel Trujillo simply because he didn’t want to have to be involved with the planning for his June wedding. Not so, laughed the newly married lightweight up and comer. Nice. And if Nurmagomedov was distracted by the impending nuptials, he didn’t show it on fight night, as he dominated Trujillo en route to a shutout three round decision win, lifting his perfect pro MMA record to 20-0. The fight wasn’t without its share of drama though, as Nurmagomedov missed weight by two and a half pounds, leading to an altercation with his opponent at the weigh in. That he did, setting a new UFC record of 21 takedowns in 27 attempts, making what was expected to be an intriguing clash of rising lightweight stars a one-sided affair. So far, Nurmagomedov dominating and making things look easy has been par for the course, an impressive feat for someone who won’t hit his 25th birthday until September. He admits that his 2012 decision win over Gleison Tibau was his most challenging bout to date, but at the same time he says that he has never doubted that his hand would be the one raised at the end of the night. That’s a confidence and maturity borne in competition both in and out of conventional outlets. Yet early on, his father Abdulmanap – a judo black belt, Ukrainian National Sambo champ, and National master of sports in freestyle wrestling – didn’t want a similar path for Khabib. Three years later, Nurmagomedov was making his pro MMA debut, submitting Vusal Bayramov in the first round. But it was in 2010 that he realized he had the talent and drive to take things even further. By 2012, he achieved that dream, and he has since won all four of his Octagon bouts, submitting Kamal Shalorus, knocking out Thiago Tavares, and decisioning Tibau and Trujillo. He trains out of the renowned AKA gym in San Jose, and after some understandable adjustments, he’s settled and ready for anything. He’s also getting used to life in the UFC, where it’s not a bad thing to go out and ask for what you want. Case in point, his Twitter request for a bout with former two division champ BJ Penn. Someday, if things keep going the way they are for the unbeaten 24-year-old, he may be on the receiving end of similar requests from hungry up and comers. 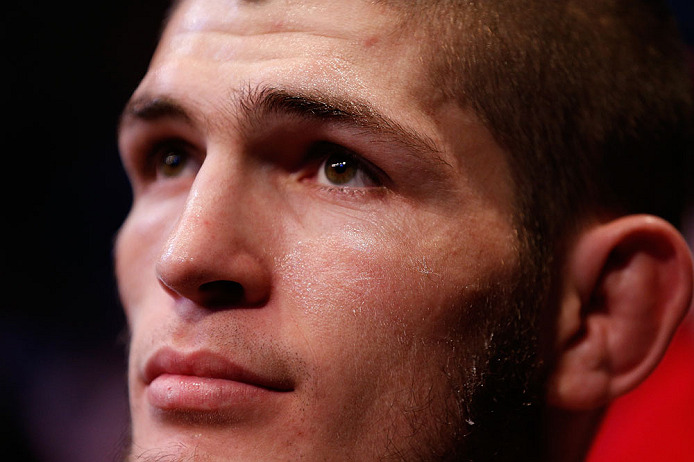 But for now, there’s still work to be done, and Nurmagomedov is more than willing to do it. So who’s next? He has no hesitation in continuing to reach for the top.